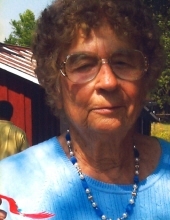 Christine Virginia (Earhart) Schaeffer, 100, widow of Edgar Allen Schaeffer, Jr. of 206 Robin Hood Road, passed away Tuesday, October 30, 2018 in the Shenandoah Nursing and Rehab in Fishersville. Mrs. Schaeffer was born on July 16, 1918 in Prince William County, Virginia, a daughter of the late Charles Hinton and Effie Catherine (Cupp) Earhart. Christine was the oldest member of the Nokesville Church of the Brethren, and retired from Piedmont Federal Savings and Loan where she was employed as Secretary. In addition to her parents and husband, Mrs. Schaeffer was preceded in death by four brothers; two sisters; and a son-in-law, Louis Bonsignore. Surviving is a son, Larry W. Schaeffer and his wife Sheralyn of Staunton; a daughter, Gail Allen (Schaeffer) Bonsignore of Yorktown Heights, New York; four grandchildren; six great-grandchildren; two step-grandchildren; four step-great-grandchildren; and a great-great granddaughter. A Celebration of life will be conducted 11:00 a.m. Friday, November 2, 2018 in the Nokesville Church of the Brethren by Pastor Angela Finet. Burial will follow in the Valley View Cemetery. The family will receive friends following the service in the church fellowship hall or the residence of her son and daughter-in-law, Larry and Sheralyn Schaeffer, 206 Robin Hood Road, Staunton. It is suggested those desiring make memorial contributions to the Nokesville Church of the Brethren, Post Office Box 56, Nokesville, Virginia 20182 or the Manassas Senior Center, 9320 Mosby Street, Manassas, Virginia 20110. The family would like to extend a sincere “Thank You” to the doctors, nurses and the staff of the Shenandoah Nursing and Rehab for the special and loving care given to their Mother. Condolences may be expressed to the family online at www.coffmanfuneralhome.net or to Gail Bonsignore, 114 D Village Road, Yorktown Heights, New York 10598. To send flowers or a remembrance gift to the family of Christine Virginia (Earhart) Schaeffer, please visit our Tribute Store. "Email Address" would like to share the life celebration of Christine Virginia (Earhart) Schaeffer. Click on the "link" to go to share a favorite memory or leave a condolence message for the family.